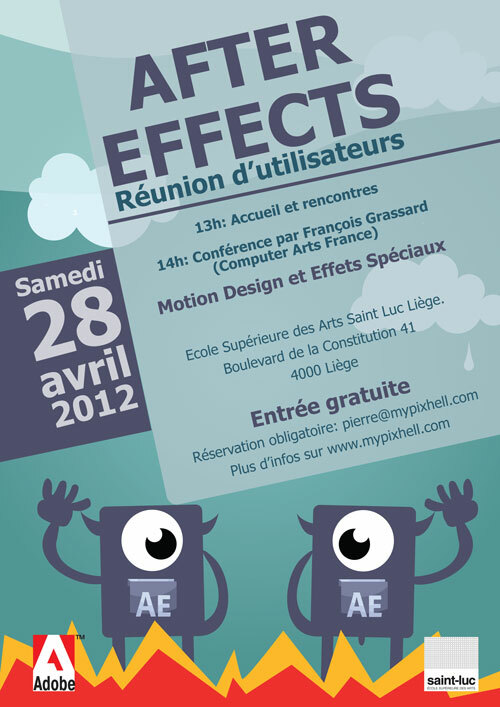 Last Saturday, 28th of April, My PixHell organized an “Adobe After Effects users” meeting at l’École Supérieure des Arts Saint–Luc de liège. They invited François Grassard to give a speech about 3D technologies in general. Two things need to be stressed, such as a good and a bad news. The good news is how these powerful softwares (a good percentage of which are released under open source and/or free licenses) allow young techno-artists to produce even more powerful info-visions (it was interesting when Grassard explained how he got used to turn a limit within the software development into an opportunity). The bad news deals with how muc time you have to dedicate to the (self)learning of these tools (sorry guys, you cannot have it all and for free): Grassard told his audience that he began to use AE fifteen years ago. Nonetheless, the real barriers to a so-called “democratic” development of info-graphical knowledge lie utterly beyond the single individual’s time and will. Info-visions don’t intend to ignore material obstacles to a free flow a crea(c)tivity: they just help people to pretend that ideas will save us. That’s why we legitimately speak of (v)ideology, the science of video ideas. Being ‘video’ the latin expression for ‘I see’, (v)ideology clearly becomes the science of ideas that I can see. Still don’t know if what I can see deserves to be trusted.